On weekends, there's a very good chance that I would skip breakfast and just have a heavy lunch. If it were up to me though, I would always start the day with Brunch. Maybe something in the mid-morning, around 10 or so.. Not too heavy (Definitely no rice).. So that by 1pm or so, I could have a heavy lunch, then a light dinner in the evening. Of course, that would be in a perfect world. One that I don't live in. But I did get the chance to try the new Brunch Menu of The Cake Club By Diamond Hotel at Bonifacio High Street, and it gave me a glimpse of what that perfect world would be like. The array of choices were impressive, and I could definitely see myself starting off my day with these mouthwatering dishes. The Cake Club has a modest sized dining area, compared to the other restaurants I've dined at in the Bonifacio High Street Central Area. 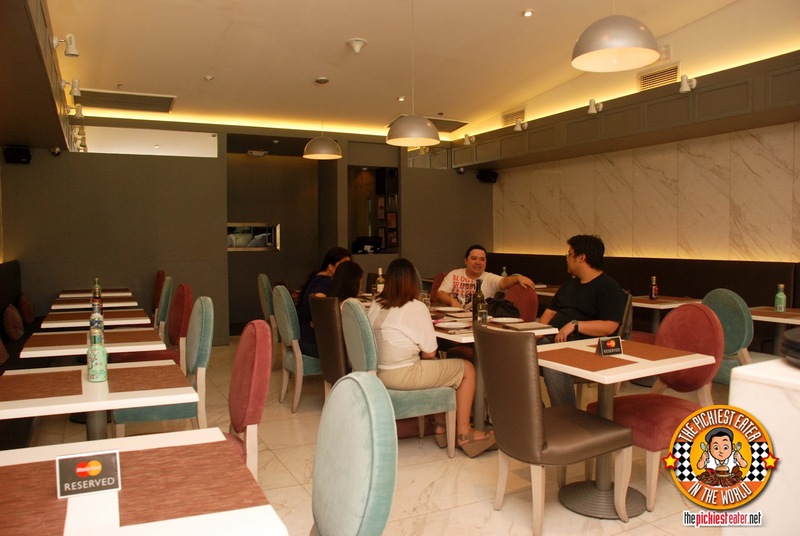 The interiors, as simple as they were, managed to exude the elegance that its big brother, The Diamond Hotel is known for. The huge Glass doors let in the sunlight and allowed it to bounce off the marble flooring and walls. Had it not been for the glass cake casing in the center of the entrance, I don't think it would be necessary to turn on a light switch until the late afternoon. 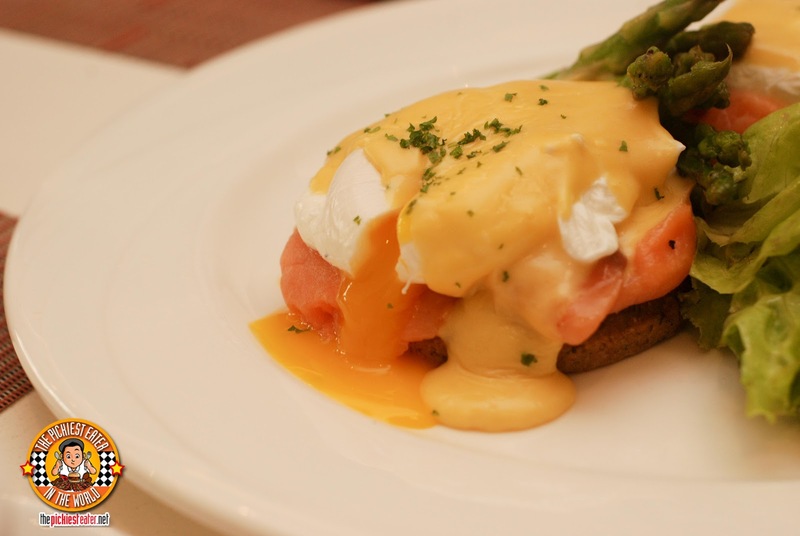 I wanted to start off with the dish that I liked the least, which was The Cake Club's take on Eggs Benedict, "Smoked Salmon Benedict". To be fair, going into it, it never had a chance with me, simply because I'm not too fond of Smoked Salmon (the type that kinda still seems a bit raw). Also, i'm a big proponent of bread, and I was looking forward to the English Muffin that Eggs Benedict usually comes in. Instead, they came on a bed of whole wheat & Quinoa pancake. I'm honestly not sure I know what Quinoa is, but all I know is that its not what you usually use to make an English muffin. The pancake had a different texture than what I was used to, and flavorwise, it wasn't really anything that would stand out. And as you can imagine, I didn't touch the olive oil cooked Asparagus. Regardless about how I felt about the Salmon and the Pancake, the technique used in making this dish could not be denied. 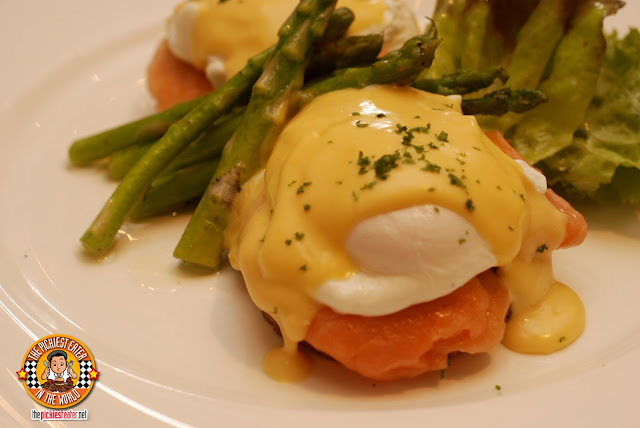 The egg was poached to perfection, and the Hollandaise sauce was phenomenal. It had a creaminess to it, followed by a tinge of acid that hits you just right at the back end. The bowl of Muesli was placed in front of us, and Rina asked me, "What's that?". I said, "Muesli". She then asked, "What does it taste like?". It was only then that I realized that I had never actually tried muesli before, making The Cake Club's Bircher Muesli, the dish that popped my Muesli Cherry. 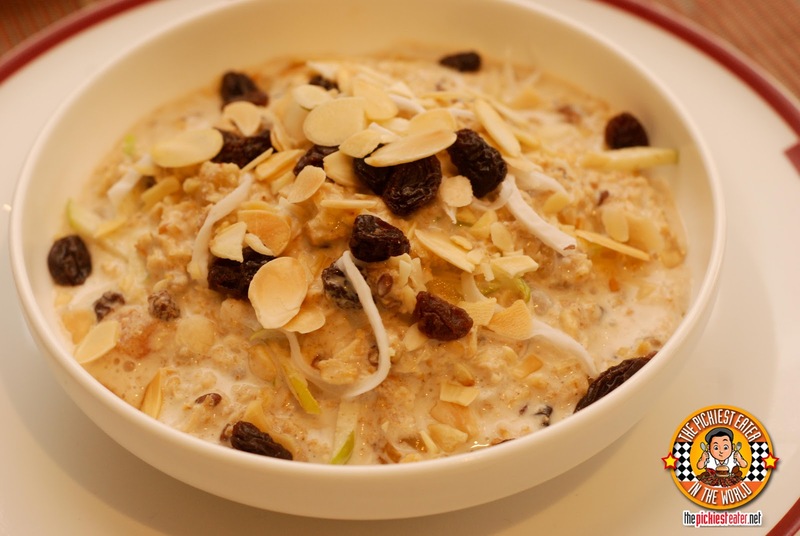 I mainly stayed away from it because its a combination of healthy stuff, like dried fruits,rolled oats and milk. I figured that if it's a "healthy breakfast", how good could it be? As it turns out, the answer to that, is "Very". I just took a scoopful and realized that I had been missing out on a whole lot, all these years. I doubt this bowl would have replaced any of my bacon and country sausage breakfasts, but I could have easily eaten this in lieu of cereal or toast. The mixture of the oats with the natural sweetness of the fruits, soaked into the creaminess of the milk, and just a light touch of tartness from the yogurt, makes this a very well balanced way to start the day. Heavy enough to get you going, without making you feel bloated afterwards (Although sadly, "bloated" is my default setting). 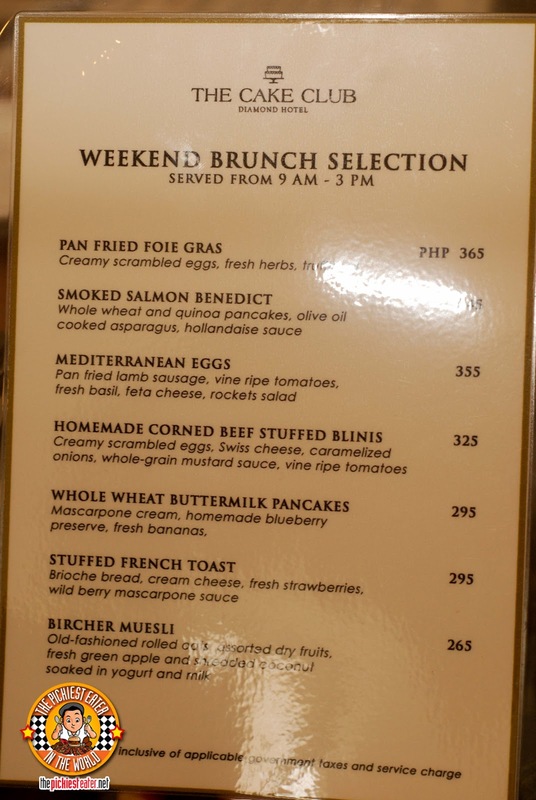 The next Brunch dish they brought out was the Stuffed French Toast (P295). Stuffed because sandwiched in between the two slices of the Brioche bread was cream cheese and sliced strawberries, with a side of Wild Berry Marscapone sauce. This was a bit deceiving, because it's actually much heavier than it looks. Great balance of natural, fruity sweetness, as well as creaminess. My only comment was.. Call me old school but I was looking for the traditional french toast that was dredged in batter and fried.. 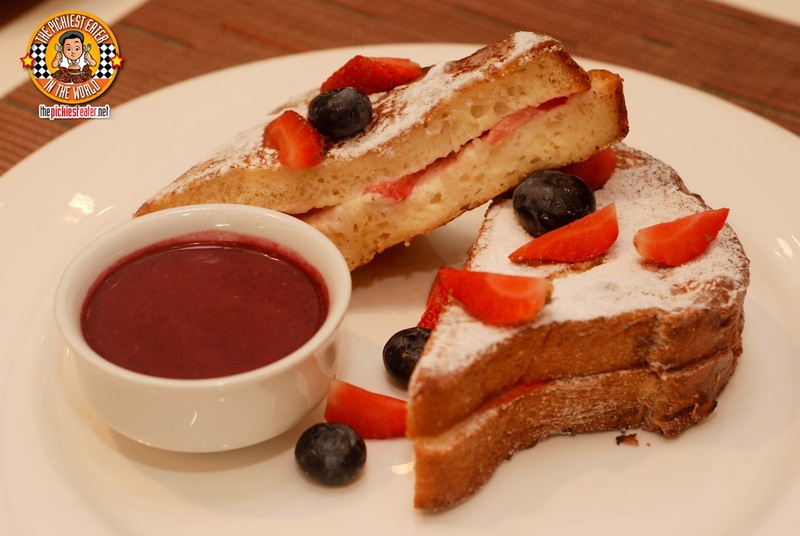 The batter on this was a bit light, so it seemed more like a stuffed toast sandwich than a French Toast one. 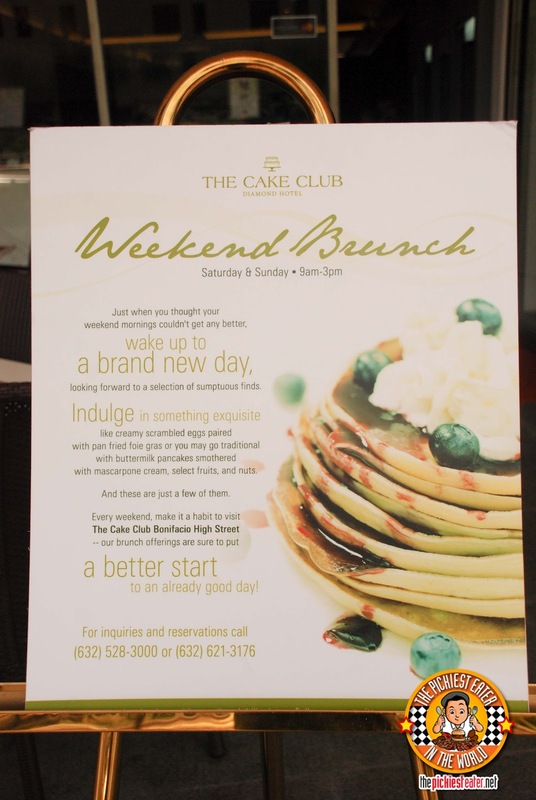 In an effort to give its customers a healthier alternative to brunch that doesn't compromise flavor, The Cake Club developed a Whole Wheat Buttermilk Pancake (P295) dish. 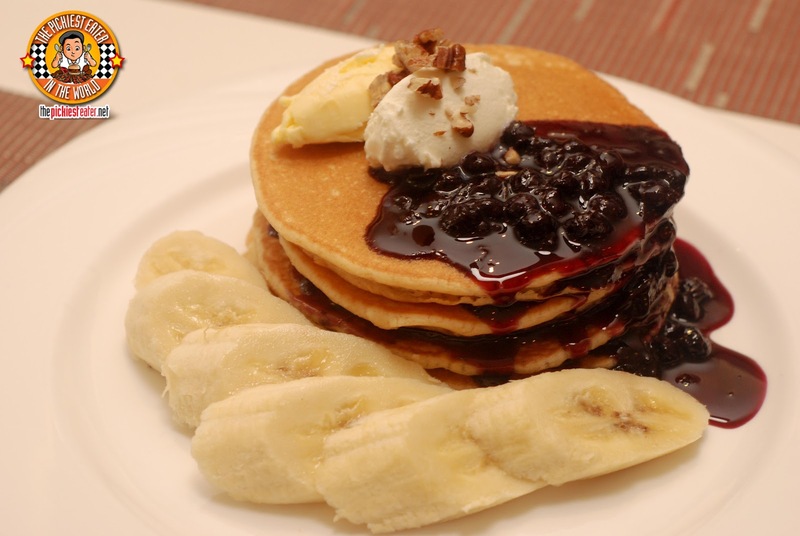 It's a short stack of pancakes, swarming in their very own Blueberry syrup, and topped off with Marscapone Cream, and with a side of fresh bananas. I was pleasantly surprised to see the taste wasn't too far off from the buttermilk pancakes that I love, albeit the texture was a tad bit drier. Of course, when all the components are mixed together, it doesn't seem like much of an issue. For a less indulgent version of Buttermilk Pancakes, this was pretty darn good. My sister Raquel asks me all the time why I don't eat Foie Gras so much. 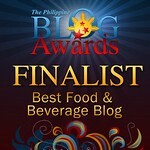 Well, now that i'm a blogger, I always use my "Picky Eater" card. Truthfully though, my aversion to it doesn't have to do so much with the taste, as it does the thought of eating another animal's internal organ. However, The Cake Club's Pan Fried Foie Gras (P365) may very well have made a believer out of me. Raquel's description of a good Foie Gras should be buttery and melt in your mouth.. that applied perfectly to this dish. 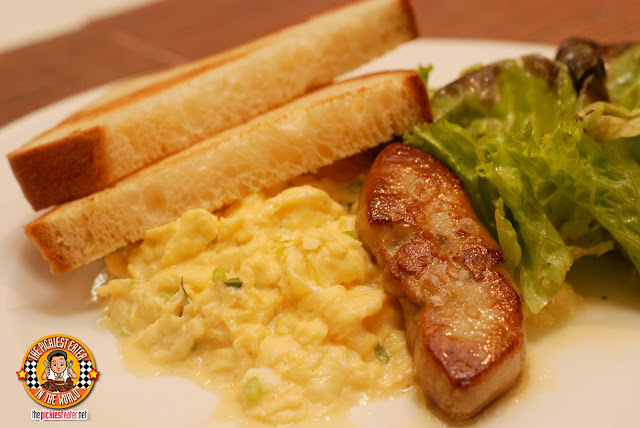 The creamy side of scrambled eggs was a nice compliment to the dish. A dish that I really enjoyed was the Homemade Corned Beef Stuffed Blinis. 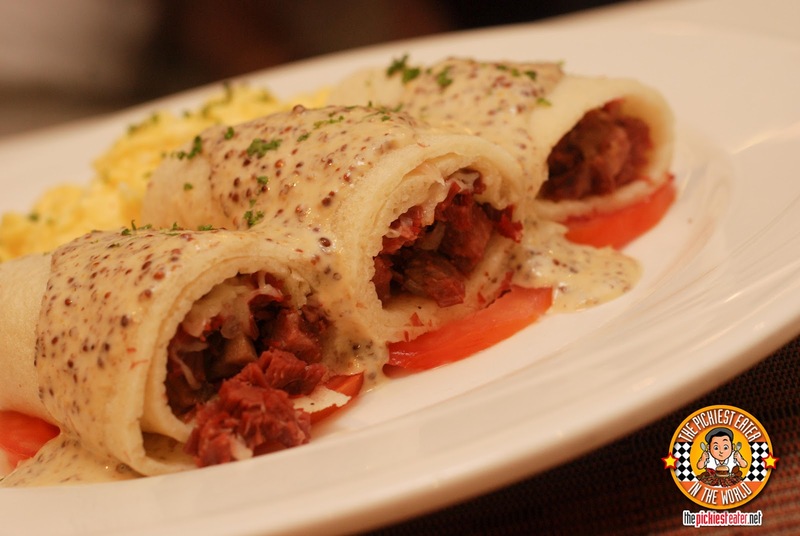 Meaty pieces of shredded corned beef, stuffed in a thin pancake, caramelized onions, Swiss Cheese and rolled up, then drizzled with Whole Grain Mustard Sauce, and finally, laid on a bed of sliced Vine Ripe Tomatoes. The savory, flavorful corned beef, and the creaminess of the blini was balanced out nicely by the acid on the mustard sauce. My favorite dish of the morning was undoubtedly the Mediterranean Eggs (P355). 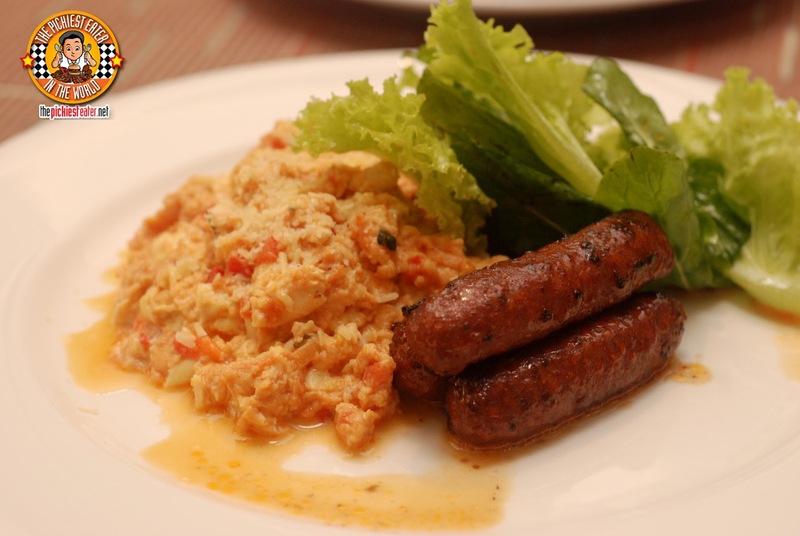 Three pieces of Pan fried lamb breakfast sausages, with the type of scrambled eggs that my yaya used to make, that took me back to a simpler time. Scrambled eggs, mixed with bits of tomato, onion, and other delicious spices. The sausage had the gaminess of lamb, with an added pinch of heat to it, that hits your taste buds oh-so-subtly. AMAZING. 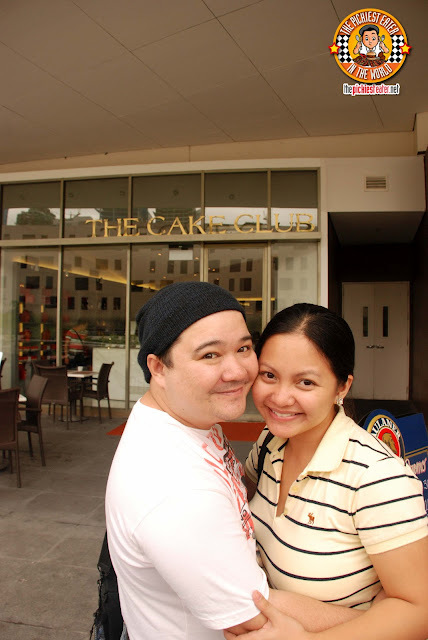 The Cake Club is an ideal choice for a morning meal with my family.. Classy atmosphere, with delicious food that won't leave you feeling like a pregnant hippopotamus trying to run the decathlon all day (Unless you're like me that sampled everything on the menu, so that's EXACTLY how I felt). Stay tuned for more of my adventures at The Cake Club! Oh my, their foods are kind of expensive. That whole wheat buttermilk pancake looks delish though and I might be willing to shell out a little bit just to have a taste of it.